Fave Christmas windows of New York: Lord & Taylor, Macy’s | Oh, the Places We See . . . But we’re not alone, judging from the crowds who also love staring into holiday windows and pointing out their favorite things. This Christmas 2015 season was unseasonably warm in NYC, so some folks took advantage of the sunshine in their own sort of way. 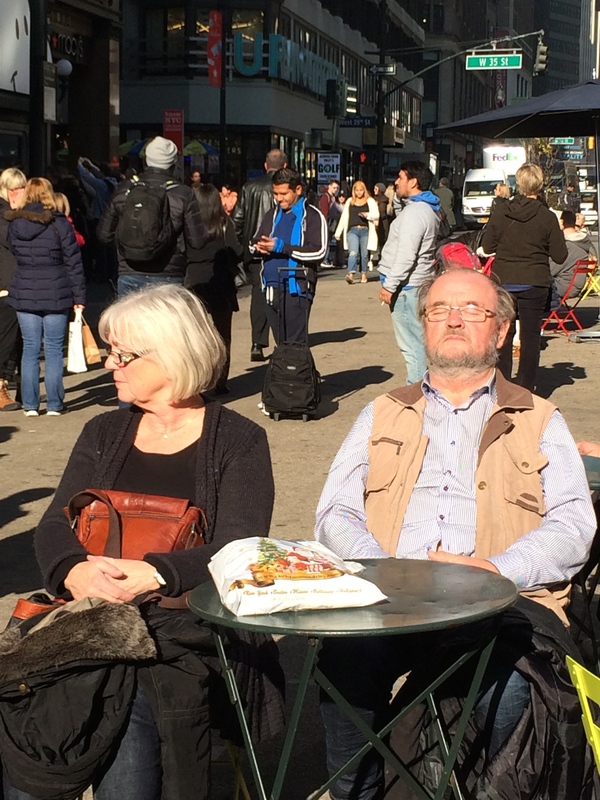 Soaking up the rays on a warm December day in Macy’s New York City plaza. 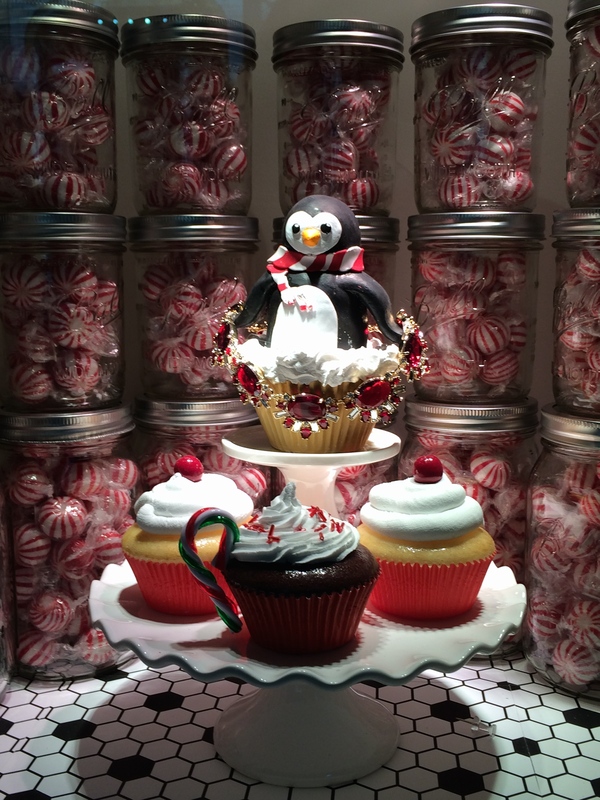 Two stores got our vote for best windows: Lord & Taylor and Macy’s. (By no means, however, did we see them all.) We like beauty, humor and any combination of the two as well as clever interpretations of a theme — and these stores had all of that and more. 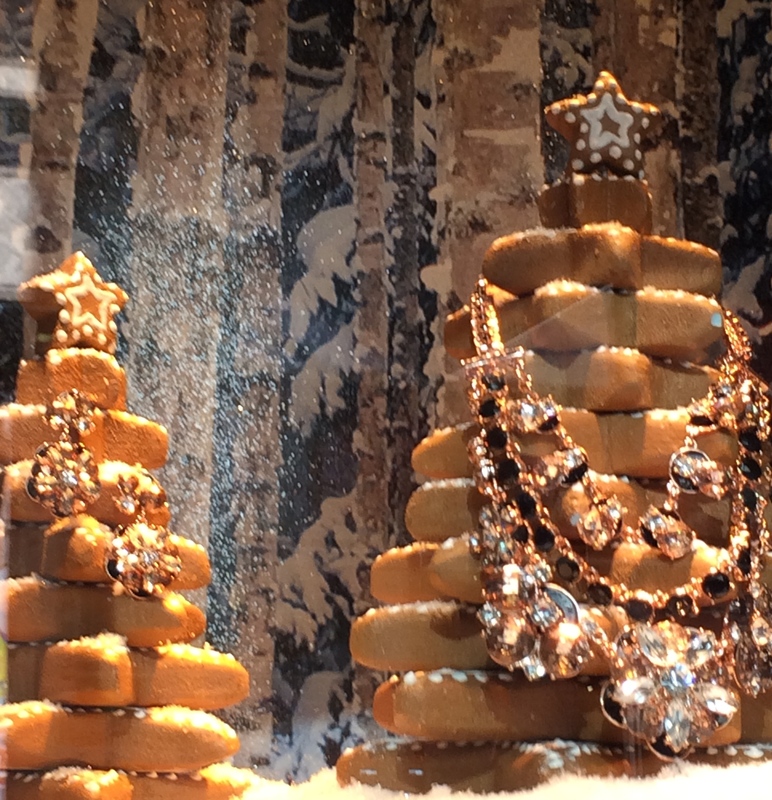 Stacked gingerbread trees hold tempting baubles at the Lord & Taylor windows, New York City. Lord & Taylor’s patisserie windows delighted us “window tourists.” Sugar-covered delicacies in bakery windows beckoned, and you could hear window peepers (like us) saying Mmmmmm while they gazed longingly at the culinary delights. 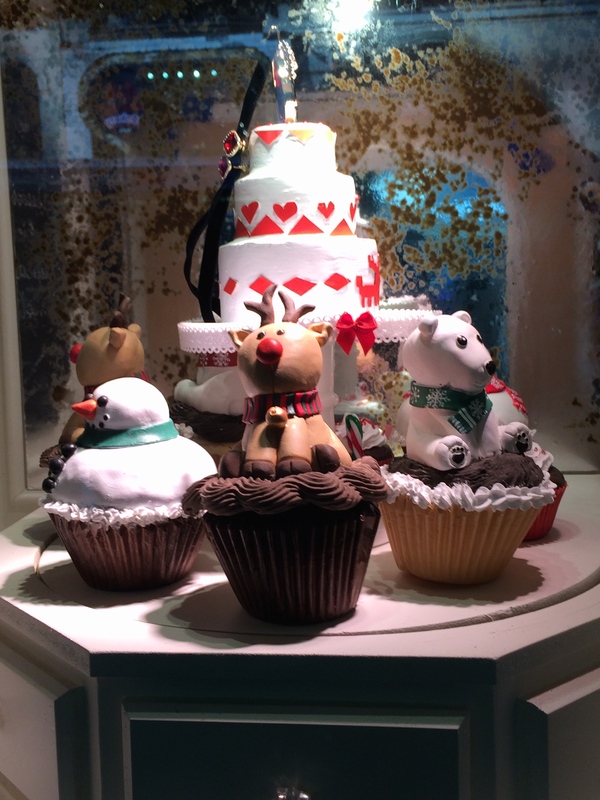 Cuteness on every cupcake: Lord & Taylor windows 2015. 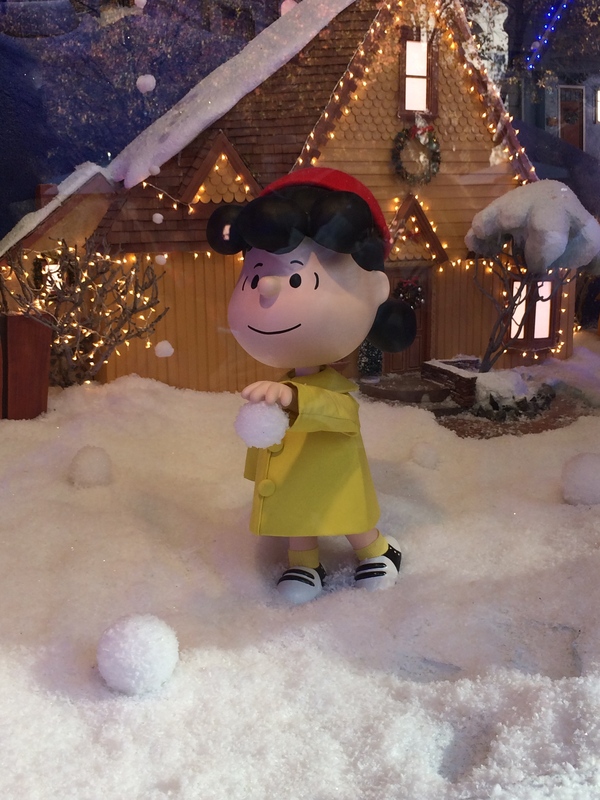 But the Peanuts children and the interactive windows at Macy’s won our vote for Best of Show. The story line of Charlie Brown being in the doldrums at what everyone considers the “happiest time of the year” made for great narrative. 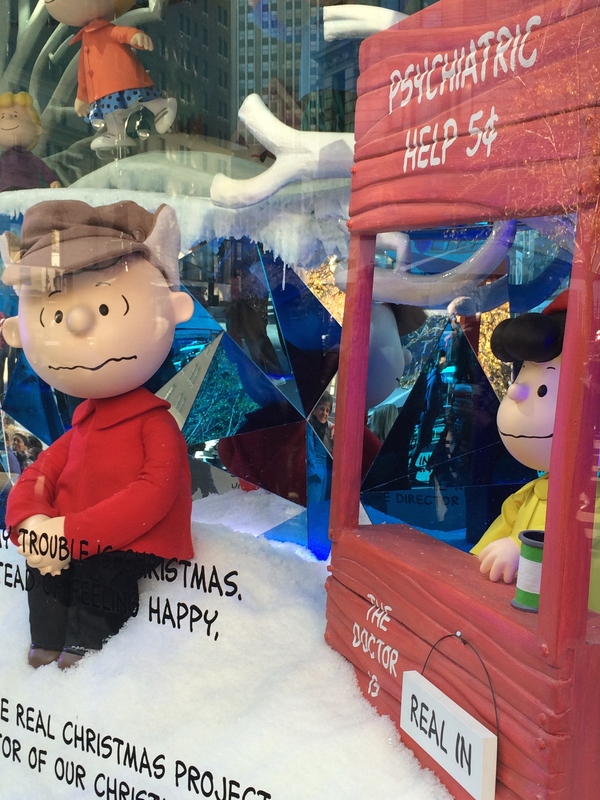 Charlie Brown needs support from Linus even at the happiest time of year. And not much could cheer him up — not even Lucy’s budget psychiatry. Not even Lucy can cheer up Charlie Brown this Christmas. But as we all know, it’s not things like trees and presents that make the difference. Not even music by Schroeder. 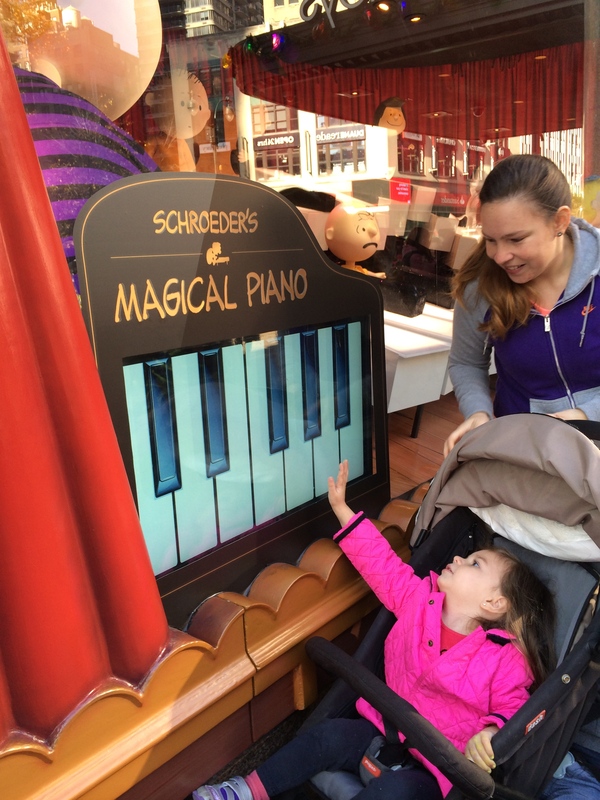 Children stopped to play with the interactive piano at Macy’s NYC. Peanuts music in background! What conjures up good feelings at Christmas? It’s friends, of course. Something Charlie Brown has aplenty. Just by opening the door, Charlie Brown can find friends. Different friends appear each time the door opens, and Charlie Brown feels uplifted. 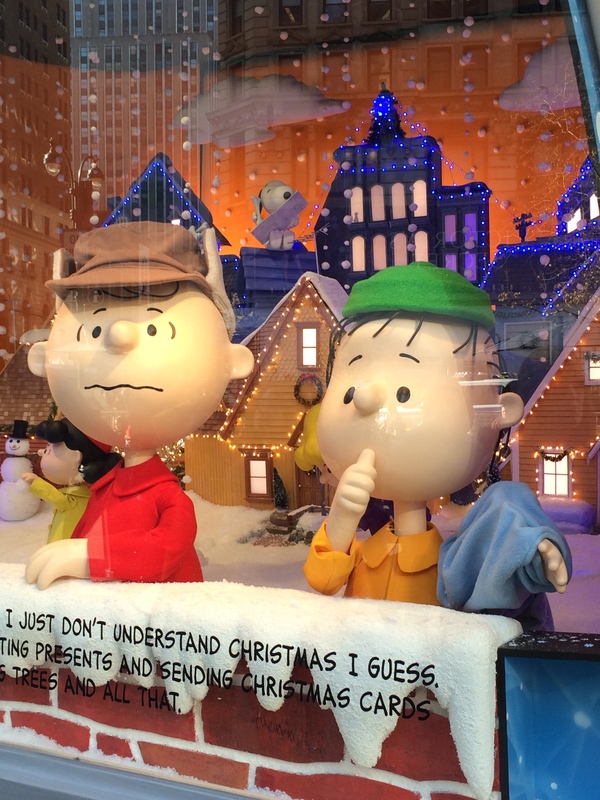 So all is well in Peanuts land with Charlie Brown ready for the holidays and smiling at the crowd at Macy’s. 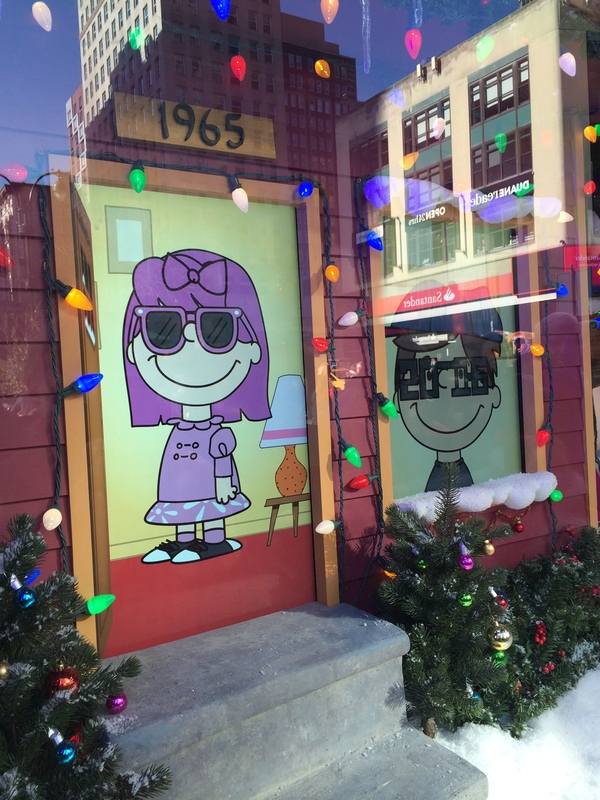 You, too, can be a Peanuts friend by designing your own likeness at the store window. 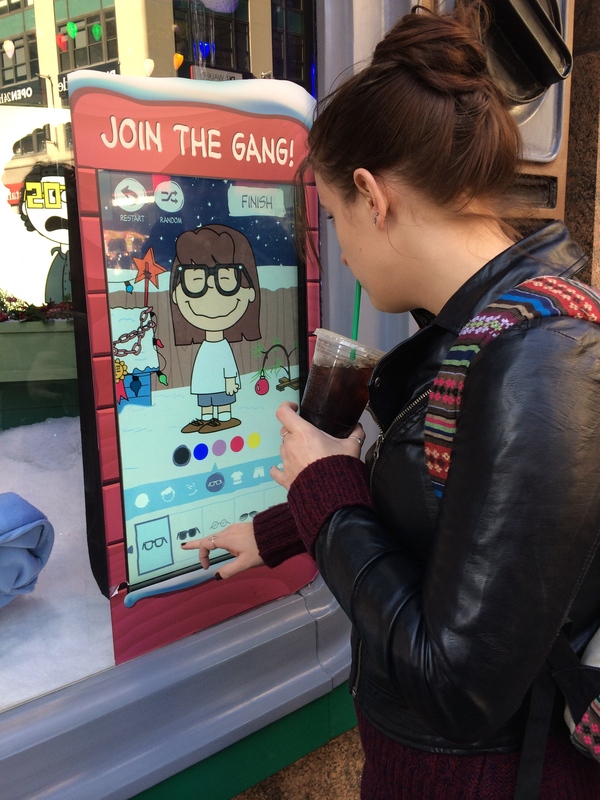 Interactive window allows anyone to design a Peanuts character at Macy’s NYC 2015. And so it goes. Windows make people happy. And New York at Christmas wouldn’t be the same without ’em. Even a snowball fight with friends can be fun — especially if you’re in NYC! 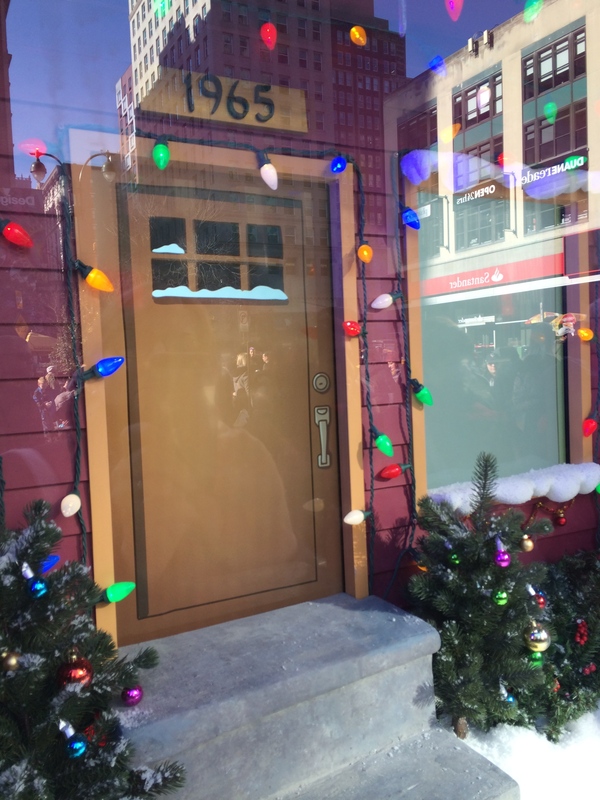 This entry was posted in New York, Travel and tagged Charlie Brown, Christmas NYC, interactive windows, Lord & Taylor, Lucy, Macy's, peanuts. Bookmark the permalink. Walking and taking in the views is my favorite way to visit places, too. Happiest of holidays to you. Thanks for your comment. I apologize for being delayed in getting back to you, but Christmas/New Year’s stuff just piled up!!! Best wishes for seeing more great things in 2016. Appreciate you!